It's November 15th which means the end of the year is growing nearer. 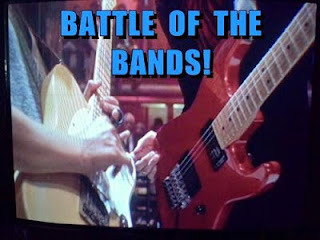 It also means that it's time for another installment of Battle of the Bands! This event which takes place on the 1st and 15th of each month was started by Far Away Eyes at Far Away Series. Blogger Stephen T McCarthy maintains the participant list and answers your questions about the event--you can find his blog with a list of participants at StMcC Presents Battle of the Bands. "Preso" is Spanish for "prisoner" or "imprisoned". In this song the term is used as a metaphor for being so involved in a love relationship that it's like being hopelessly ensnared. The song first appeared on the album Gracias by popular Mexican singer José José in 1981. If you're interested in hearing the original version then click here, but please don't vote on this version. To start this Battle we have the uber romantic song styling of Cristian Castro. Mexican singing star Castro is the son of the renown actress/entertainer Verónica Castro and popular comedian/actor Manuel "El Loco" Valdes . Cristian started his acting career as a baby when he began appearing in telenovelas and commercials with his mother. In 1992 when he was still a teenager he recorded his first album and has recorded many since. Castro's version of "Preso" stays true to the original recording by José José. Considered by some to be a genius of pop music, Aleks Syntek first caught my attention in 2006 when I heard his amazing recording of the song Historias De Danzón Y De Arrabal (linked here in case you're interested--it's well worth hearing and the video is very nicely produced). After I bought Syntek's album Leccion de Vuelo and enjoyed it for a while I discovered Syntek's version of "Preso" on the José José tribute album that I had owned for several years but apparently not listened to very often. Syntek has received and been nominated for many awards for his music and his albums have garnered gold and platinum record status. He was also part of the first judging panel on the Mexican version of the television show The Voice. This is a favorite version of Guilie Castillo-Oriard who this past Wednesday introduced my song choice for the BOTB round. If you missed Guilie's guest post I hope you'll check it out. Thanks again Guilie. Now take a listen to the techno pop version of "Preso" by Aleks Syntek. Exercise your freedom to vote! Please don't let the language deter you from enjoying these song versions--you don't have to understand the words to appreciate the music. Which song version do you like the best? Judge what you hear in the above videos. Which version do you prefer? It's up to you to help determine the winner. Due to my schedule in the upcoming week, the winner of this Battle will be announced on Monday November 23rd. After that day, during the Thanksgiving week my posting could be sporadic to none. I'll figure that out when the time comes. Hi Lee I vote for Cristian Castro. Enjoyed the post as usual. Cristian Castro taking an early lead. Hi, Lee! Happy BOTB Day, good buddy! A-ha! Now I get how you set up this battle with your "Prisoner" topic last week. Leave it to you to find the most unusual, atypical selections for your battles. I appreciate that, Lee! Now let me offer my analysis and vote. I wholeheartedly agree that Disco Tex could not have done justice to this song. :) When I read your intro for contestant #2, Aleks Syntek, and noticed the words "techno pop" I was all set to hate his rendition. Instead I kept an open mind and found a lot to like. Did you notice the similarities to Prince's 1986 hit "Kiss"? As much as I enjoyed Syntek's take on the old song I need to go the purist route and vote for the beautiful, romantic,traditional performance by Cristian Castro and his band. It brought tears to my eyes! Shady, I guess Syntek probably had some influence from Prince having come from the era he did. Cristian Castro wins still another vote. Easy for me. The slow romantic one reminded me of one of my faves- Emilio Pericoli's Al Di La. From there it was not contest. Cristian Castro gets another vote! I vote for the upbeat Syntek. Castrol seems sappy to me. Janie, thank you for preventing a shutout. NOOOOOOO!!!! Aleks Syntek, all the way!!!!! Come on, guys, don't let me down! Aleks Syntek, on the other hand, always had a sparkling charm about him, unique and genuine, and always stayed very much himself even as he grew into an artist of national and then international renown. While Cristian relied on a (not so) pretty face and a relatively good voice as his tickets to success, Aleks became a well-rounded musician, and was among the pioneers in 90's Mexico of electronic music. He disappointed me by never breaking out of the pop genre; I always thought he had the talent to get into alternative scenes, but either I was wrong or he likes pop. Either way, those personal qualities of his that I admire carry over into his music: uniqueness and genuineness. Guilie, thank you for the additional background. The way I see it, Cristian will always have a career, but Alek will have a musical legacy. Alek Syntek in the race with another vote. I'm voting for Cristian Castro's version because it is so fitting for the context of the song lyrics. I just didn't like the "techno pop" version of the song and instead preferred the very romantic version by Castro. Please give him my vote. Michele, sounds like a pretty solid affirmation to me. LEE, you know how I generally feel about "Techno Pop". I rank it right down there with "ProgRock". In this case, synthetic Syntek wasn't quite as "Techno" as I'd feared. But, nevertheless, I don't feel the meaning comes across as well in his Poppy, Upbeat, Kinda-Too-Happy "prisoner of loveness". I guess a person can be dancing to the idea that he's a prisoner of love but... I don't think that would be the normal reaction. I dunno. This is a romantic song, right? So, I think it should sound romantic, and certainly the strings in the Cristian Castro version give it a dose of romance, as opposed to the disco version by yer boy Syntek. Just to be sure, I listened to each twice. Well, I listened to CRISTIAN CASTRO twice. 1:59 of Syntek's second playing was enough to convince me my initial impression was correct. CC gets my vote. STMcC, I guess one could argue that the feeling of being imprisoned by love might come across as edgier and more poppier for a younger generation techno pop person, but I get what you're saying. I'm too big a fan of orchestra music to vote for Aleks on a Sunday morning. I liked the musical arrangement and the smooth vocals of Christian Castro. The song had meaning, passion. May have voted for Aleks on a Saturday Night though. Give my vote to Castro. Beautifully rendered. Dolorah, I too am a fan of orchestra music and strings and lush orchestrations. Castro's arrangement has a nice sound. Alek Syntek's version is so happy. Reminds me of a 'Happy Meal'... a drive up kind of love, pull through, and move on. Fast food, folks and fun. But not for me ~ I want the violins, the piano, and sappy white coat. I want the garden setting among the stars - is that really too much to ask? If I'm going to be imprisoned - put me there and wait for the shooting stars!!! Dixie, let's forget about the Happy Meal drive thru and get dinner at a fancy shmancy sit down place. Dress up time! I'll arrange the limo! You're on. I wanted to like the second one after reading Guille's comment. I even went back and played them again, but I still prefer the gentler sound of Cristian Castro. It's soft and romantic and lovely. Aleks' version is certainly unique, but it's not something I could really stand for long. I had to shut it off half way through. Give me that classic sound of Cristian Castro, aka "Christian" Castro. Beer Boys, Alek is taking a beating in this vote today. Again a vote for Cristian Castro. Lee, I really like both artists. Each has a different style and I think that might be the deciding factor. You either want the hearts and roses flow of Castro or your-love-makes-me-wanna-dance vibes by Alek. I don't know if it's the mood I"m in this evening, we just got home from a wake, but I'm totally going for happier feel of contender #2. So, give my vote to Alek. Great battle. Cathy, these votes for Castro were getting out of hand. We're due for another vote for Alek Syntek. Well, I got here just in time - my vote goes to Castro (ha ha). Both artists were unique and presented wonderful performances. I waivered for a bit...I love the beat of Syntek's song, too. But in the end, Castro gets it. The layers, the arrangement...yep, he gets it. Cherdo, you got here with plenty of time to spare. Voting is open until next weekend. I think I'd probably even vote for Fidel Castro singing this over the Syntek version. Seems really inappropriate to me. So another vote goes to Castro. My vote goes for Aleks Syntek I liked the pop version better. Mike, looks like you're going against the grain established so far. I like how Latin music is still very much all about love and tender feelings, unlike the American Modern one which has lately become all kinds of bizarre :) Latin world still has sensual sounding young stars similar to the ones we remember from the older decades. I find myself turning more and more to other countries in the lack of any good modern English lg music and recently I've quite surrounded myself with French hits! They still keep it normal and genuine. Dezmond, I don't keep up with too much new music like I used to so I can't say too much about what is out there. One thing is for sure: There is a world of music out there waiting to be discovered. Those were both very different. The first one had a great voice, but it was too much like lounge music. I liked Aleks Syntek's upbeat version better. When we lived in Albuquerque, there were always musicians in downtown's Old Town and I miss hearing the music. L.Diane, I can't say you've saved the day for Alek yet, but your vote helped. Cristian Castro, without hesitation. There is passion and meaning in his voice, which overcomes the Syntek version. While Syntek's version is certainly lively - even fun, it's Christian for me. Guess I'm a hopeless romantic after all - ha! Give my vote to Aleks Syntek. Being unfamiliar with this song gives me a fresh perspective in which to judge. I think both were done very well and I would listen to either. But I like Aleks' peppier version. Jeffrey, finally another vote for what has been the underdog in this contest. Guilie, I like your cheer leading for Aleks, but he's going to need more votes to pull off a win here. I'm actually surprised by my choice, but I preferred Castro's version. Shannon, the way this vote has been going I'm not surprised by your pick. I too was a bit put off by the "Techno Pop" label, but did try to keep an open mind. Sorry, Guilie! My ears were not happy. Call me old-fashioned, but I have to go with Cristian, even if he is a bit bland. Debbie, no help for Aleks from you. The first one had more of a feel to it than the later. So #1 for me. Pat, it looks like #1 is going to be #1 in the voting results unless some Syntek fans show up in mass. I have no idea what anyone is saying, but Syntak's version is pretty catchy! Madilyn, I'm glad you weren't influenced by all the other votes. Syntek gets my vote - snappier, brighter, beaty ... Castro didn't ring true to me - it was as if he wasn't really imprisoned ..
Susan S, maybe there's hope for techno pop after all. Jaclyn, I wonder who it is that will win? Your vote for Cristian Castro noted. I'm voting for Alek Syntek. I have a soft spot for the underdog. Probably why I hardly ever win bets. TBN, More votes like yours and this underdog could have a chance. I vote for Castro. The other version seems inappropriate considering the content of the song. Aleks Syntek is so much fun. I started dancing in my chair! He gets my vote. Loni, Aleks got you dancing so that's kind of a good thing I think. I liked the first one--Castro. Very classy. Cristian Castro sang this one like it should be sung, that uber-romantic style with the lush strings in the background. Syntek (whose name sounds like a brand of motor oil) got on my nerves after a while. Give my vote to Castro. John, I don't think Aleks's name is supposed to make anyone think of motor oil, but maybe techno music. Cristian Castro! Great voice and expression. I didn't care too much for the second video. Medeia, you are with the majority on this. Another vote for Cristian Castro. I really liked Cristian Castro's version of the song. Aleks Syntek gets points for originality, but it was just too much.